Former Pennsylvania Gov. 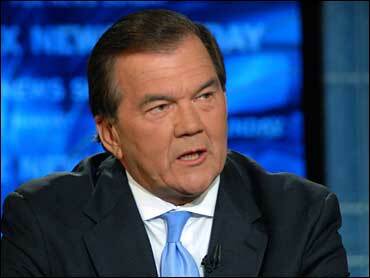 Tom Ridge said Sunday he thinks Republicans would accept a vice presidential candidate who supports abortion rights. But, he said, whomever John McCain picks as a running mate should defer to McCain on the issue. McCain opposes abortion rights, but he riled some conservatives last week when he suggested his running mate could - like Ridge - support abortion rights. "What he was saying to the rest of the world is that we need to accept both points of view," Ridge said in a broadcast interview. "He's not judgmental about me or my belief. He just disagrees with me." With vice presidential picks coming any day now, several possible candidates for the No. 2 spot appeared on the Sunday talk shows. Barack Obama will choose soon; the Democratic National Convention, where Obama and his running mate will be nominated, is just a week away. Obama and his closest advisers are refusing to talk about the process, leaving his schedule as a source for possible clues. On Monday, he planned to visit New Mexico, home of Gov. Bill Richardson, and he planned to spend Wednesday and Thursday in Virginia, home of Gov. Tim Kaine. Both governors were on the shows Sunday, but neither revealed whether they expected to be Obama's choice. "I'm not going to talk about conversations with the campaign," Kaine said. He added, "I think it's very unlikely." Obama's travels to Virginia and New Mexico don't necessarily mean anything about the vice presidential search; both are swing states that have been getting attention from his campaign. On Saturday night during a forum at Sadddleback Church, Obama brought up another potential running mate - former Georgia Sen. Sam Nunn - when asked to name three people he would rely on for counsel as president. Obama listed Nunn after his wife and grandmother. Ridge is believed to be on McCain's short list of vice presidential candidates, though it would be a major break with Republican orthodoxy for McCain to pick a running mate who supports abortion rights. "I think that would be up to, first of all, to John to decide whether he wants a pro-choice running mate; then we would have to see how the Republican Party would rally around it," Ridge said. "At the end of the day, I think the Republican Party will be comfortable with whatever choice John makes." McCain's statement last week was seen as an appeal to centrist voters. On Sunday, Ridge tried to soothe conservatives by stating that McCain's view on the issue would prevail in a McCain administration. "The last time I checked, the vice president is not an independent voice. He echoes the position of the president of the United States," Ridge said. "I think it's the responsibility of the vice president. If you're unwilling or unable to do that, then I think you should defer to someone else." Louisiana Gov. Bobby Jindal, another possible McCain running mate, said "no window's open" to him being the vice presidential nominee. "He's not going to ask," Jindal said. "I don't want to be vice president. I'm not going to be the nominee." Ridge was interviewed on "Fox News Sunday." Kaine and Jindal were on NBC's "Meet the Press."